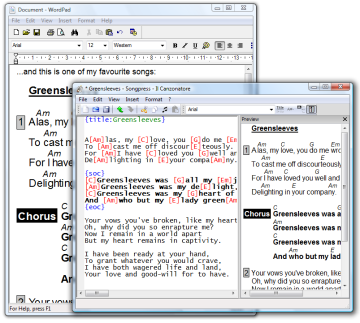 Songpress is a free, easy to use song typeset program for Windows and Linux, that generates high-quality songbooks. Songpress is focused on song formatting. Once your song is ready, you can paste it into your favorite Windows program, to give your songbook the look you like the most. If you need help, or wish to discuss, please visit our user support group. Songpress 1.7.2 installer (size: 18.6 MB) for Microsoft Windows. Only for Windows 2000 users: if Songpress does not start, then you need to download and install this library from Microsoft. How does it look a songbook generated with Songpress? You can find some samples here. If you clic on these images, you will be redirected to our Scout Gruop site, where you can download both the PDF of the songbooks and the original ChordPro files used to generate them. Songpress is released under the terms of an open source license, the GNU General Public License version 2. You can download the source code (size: 688 KB) of the program. You can even run the program from the source, without needing to download the Windows binary. You need to install Python 3 and wxPython (Phoenix). Then enter in the src directory and type: python main.py. We started the project in order to create a songbook for the Mass for our boy scout group (please download the songbook (in Italian) if you want to have a look at Songpress output). We quickly created the typesetting algorithm and the clipboard functionality. "In order to quiclky and accurately typeset our songbook, we created a piece of software. [...] Our intention is to improve it and distribute it for free (as an open source software) in our group website." At the beginning we didn't have much time to improve the software into a complete application for non-geek users. Some times ago we decided to rewrite the program in Python (much more fun to program in than C++)... and the promise has been kept! Songpress is hosted at Github (previously, on Google Code and BerliOS). and... donating some money to our scout group!! You can find more information about the ChordPro format here. If you like Songpress, please consider donating. Any amount of money will be appreciated! It will be used to fund the activities of our scout group, FSE Roma 21.